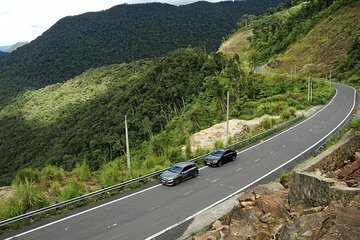 Esplora una serie di affascinanti attrazioni e splendidi scenari naturali durante questo viaggio di sola andata in auto privata da Hue a Hoi An. Sfrutta al massimo il tuo viaggio di 90 miglia (145 km) tra le due città mentre visiti i siti, tra cui la spiaggia di Lang Co, il panoramico Hai Van Pass, il villaggio di sculture in pietra non nuoc, le montagne di marmo e altro ancora. Meglio di tutti, puoi scegliere i siti che vuoi visitare. Il tuo trasferimento copre anche un autista di lingua inglese, pedaggi stradali e tariffe di parcheggio. The driver was polite and punctual, and it was great to have pickup and dropoff door-to-door. He was flexible in showing us sights we wanted to see, and skipped those we weren't interested in. The only negative about this experience was the confusion in specifying the time and place. There was no information on how to get in touch with the company to tell us where we were staying. In the end I had to enlist the help of a local who spoke Vietnamese AND had a Vietnamese cell phone so we could call and text the owner. We had Chung drive us from Hue to Hoi An, he spoke very good English and was lovely to spend time with, he stopped whenever we wanted to and made recommendations along the way. We never felt rushed at any stop and he offered to take pictures and was very informative for the duration of the drive. Highly recommend! Our tour guide was nice and kind all the time.His english was ok and he was always aware to fulfil our needs.I recommend this trip! Really enjoyed the day. Driver Tommy was terrific. He spoke great English and gave us lots of informarion along the way. The day was totally at our pace, with stops as long or short as we wanted. Highly recommend.. Very good safe driver, looked after us well throughout the journey. Stopped when we wanted to and allowed us sufficient time to explore when we stopped. I would recommend doing this but make sure the driver can speak more english so you get more understanding of the area and where you are going, as for as that we got from A - B nice drive but would have preferred a commentary along the way..